Visit Muktinath temple – a sacred pilgrim site for both Hindu and Buddhist. Visit Kali Gandaki Valley – the world's deepest river gorge. Heli flight to Pokhara from Lomanthang – a 20 minutes flight through the amazing landscape of walled city to the City of Phewa Lake. 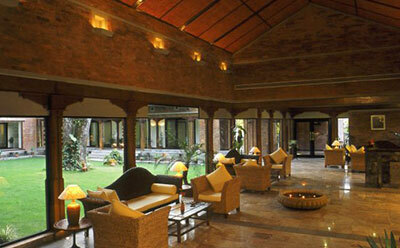 1 Night hotel Pokhara in Shangri-La on BB Twin Room. 7 nights Normal Local Lodge on FB Twin Room. Flight: KTM-PKR & PKR-Jomsom with airport tax. Heli Flight : Lo Manthang–Pokhara. 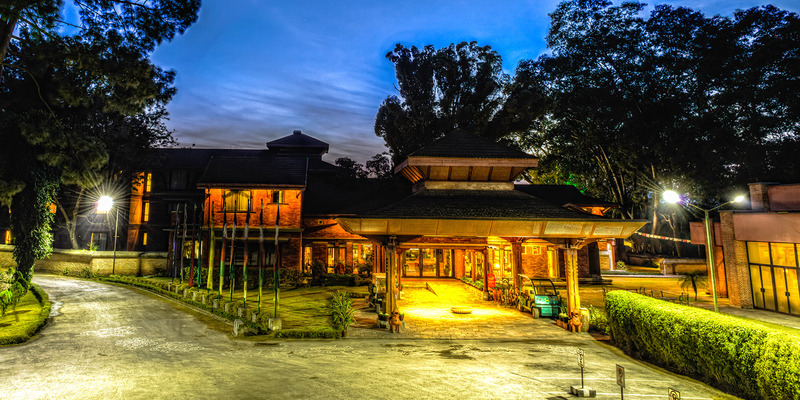 Flight: PKR–KTM with airport Tax. Today we will fly to Pokhara; a short scenic 25 minutes flight. On arrival at Pokhara airport we are transferred to Hotel. 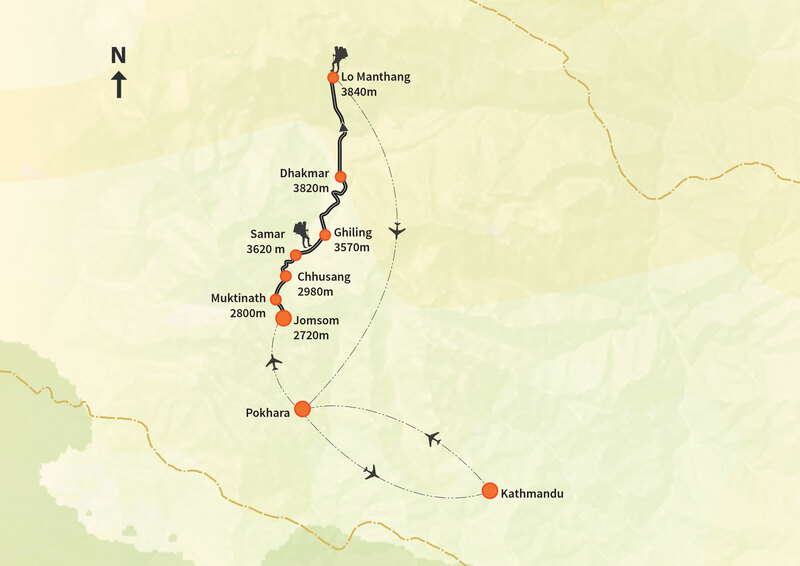 Early morning we will fly to Jomsom which takes approx. 20 minutes having close views of Annapurna Range, Dhaulagiri and others. Upon landing at the airport, we will meet with our crew members and head out for Kagbeni. It takes about 3.5 hrs walk to reach Kagbeni from Jomsom. On reaching the Kagbeni Village, we will complete our paperwork at police check post before entering this long forbidden region of Nepal. We continue trekking upto Muktinath from here for another 2 hrs. trek. Today we will head out for Chuksang. The trail passes through the mix of high trail and riverbank with the endless stretch of sand to the village of Tangbe. The village is a labyrinth of narrow alleys, fields of buckwheat and barley and apple orchards with the view of Nilgiri Peak on the back. After 2 hrs hike, we will reach Chuksang village which lies at the confluence of the Narshing Khola (River) and Kali Gandaki River. Today we will hike to Samar passing through a small settlement known as Chele village. During the walk, you can find a distinct change in topography, culture, lifestyle, and people. 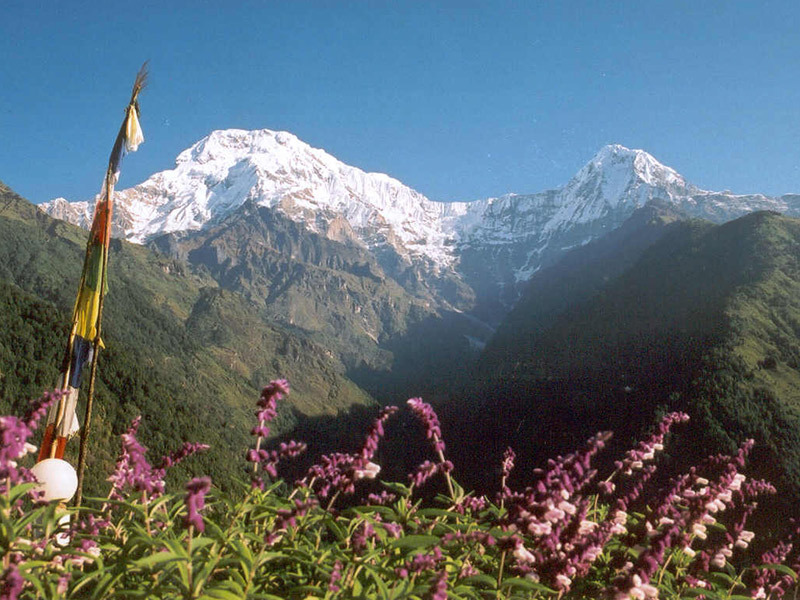 From Chele, we will climb a steep spur to Taklam La (3624m) and Dajong La (3660m). After crossing these two passes, you will descend on a pleasant trail to Samar. From Samar, we climb to a ridge and then descend into a large gorge past a Chorten. We then pass through the Ranchug cave, one of the holiest places in Mustang. We then cross a stream, climb a pass and then descend along a ridge to Shyangmochen. From there the trail climbs gently to Ghiling. From Ghiling, we head west, climbing gently through fields to Tama Gaun. Then we head north to reach Nyi La (4020 m). We then descend down from the pass and after 30 minutes’ walk, we come to a trail junction from where we head straight to Dhakmar Village. After early breakfast, we head out for a long day walk to Lo Manthang. 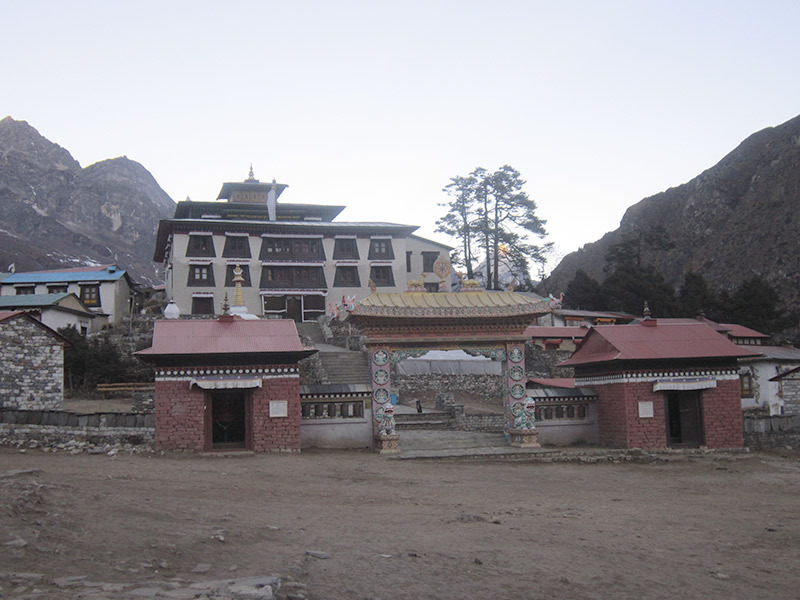 We will pass through Lo Gekar and Ghar Gompa (Monastery) which is one of the major attraction of the day. Explore the fascinating city of Lo-Manthang. Today we will visit the four major temples Namgyal Gompa (situated on the hilltop and also used as a local court), Champa Lakhang (God House), Thugchen Gompa and Chyodi Gompa. Other attraction is the king's palace; an imposing building in the center of the city and is occupied by the current King and Queen.